Skolkovo Foundation president Victor Vekselberg praised the achievements of the innovation city’s educational institutions this year at a foundation council meeting on Friday. 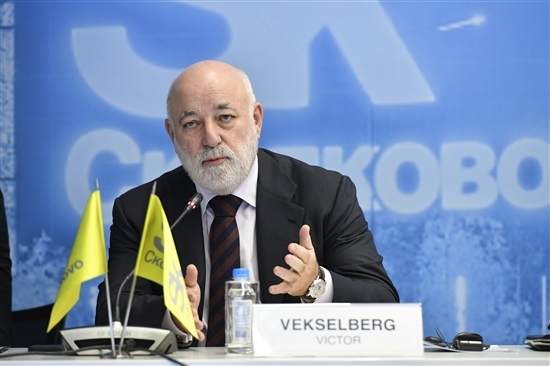 Skolkovo Foundation president Victor Vekselberg speaking at the council meeting on Friday. Photo: Sk.ru. The Skolkovo Institute of Science and Technology (Skoltech) has achieved major successes in the last year, both internationally and in terms of specific research projects, Vekselberg told the Skolkovo Foundation council, noting that Skoltech’s board of trustees had met earlier in the week and approved the private graduate research university’s development strategy. “A very worthy and highly qualified team of professors and teachers has been formed, and the students are some of the best,” said Vekselberg, adding that Skoltech is a key element of the Skolkovo ecosystem. Earlier Friday, the Skolkovo International Gymnasium board of trustees held its own meeting. “It [the gymnasium] has proved to be a highly qualified and attractive educational centre, and competition to send children there is already extremely high,” said Vekselberg, noting that the gymnasium is only in its third academic year. He encouraged members of the Skolkovo Foundation board to find time to visit the school, which moved into its purpose-built home at the beginning of this academic year. The foundation itself is going from strength to strength and plays a key role in the development of the Russian economy, just as it was set up to do, council members heard. “The digital economy occupies an increasingly important role in the plans and programmes being developed by the Russian leadership. As one of the projects being realised in accordance with state priorities, we play an active role in initiatives related to the digital economy: Skolkovo is the coordinator of initiatives for proposed legislative and regulatory amendments,” said Vekselberg. Craig Barrett, the retired CEO of Intel Corporation who is co-chairman of the Skolkovo Foundation council, also noted the importance of Skolkovo to the Russian economy. “I’m very impressed with the progress Skolkovo has made and continues to make,” said Barrett, who was taking part in the meeting from the U.S. via video link.